On the 1-year anniversary of the Parkland School shooting, Sinclair Theatre offers a staged reading of William Mastrosimone's play written to raise awareness of school violence. 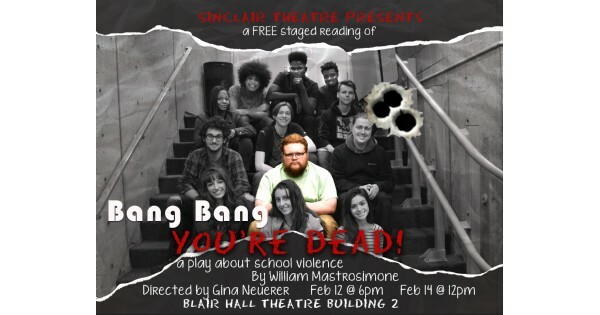 On the one-year anniversary of the Parkland School shooting, Sinclair Theatre will offer a FREE staged reading of Bang, Bang, You're Dead in Blair Hall Theatre on Feb. 12th at 6 p.m. and Feb. 14th at noon. William Mastrosimone wrote this play nearly 20 years ago to raise awareness of school violence, and allows organizations to perform it free of charge. General seating begins 30 minutes prior to curtain and latecomers may not be seated. Performance lasts approximately 1 hour. Please consider bringing a group as a way to create discussion and awareness. Find more events like "Bang, Bang, You're Dead"
Sinclair Community College's premiere theatre facility. The facility is an elegant 459-seat proscenium style auditorium that serves the entire community.